Published on Feb 16, 2017Breaking News: On Standing Rock Sioux Tribal Council's request the Bureau of Indian Affairs Police gave Sacred Stone Camp a stunning 10 Day Eviction Notice in person at camp that says the entirety of Sacred Stone Prayer Camp needs to go or property can be seized and people charged with trespassing. Share and spread the word!!!!!!!!! LaDonna Tamakawastewin Allard whose family has owned this beautiful land along the Cannonball River where so much healing is taking place for generations and Water Protectors are being targeted for standing up for the Water and Mother Earth! We must ask ourselves why? Why? 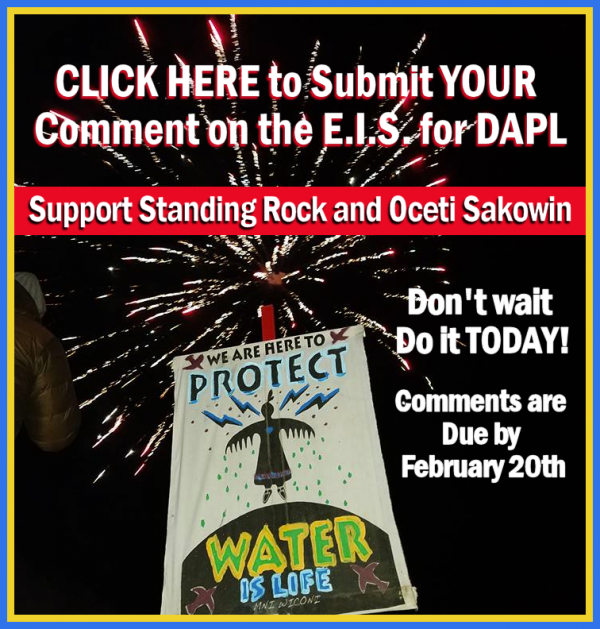 Send Your Comments on DAPL E.I.S. Write YOUR comment to the Army Corps of Engineers demanding a comprehensive environmental review of the Dakota Access Pipeline. We have added 25 Reasons to Oppose this pipeline below. We’ve also provided links to more information if needed. From the first days in office Trump has made it no secret that he will do whatever he can to finish this and other pipelines. He cares nothing for the future of our nation or people as he pushes us ever-closer to becoming a resource colony for the world. He went another step further and ordered the US Army Corps of Engineers to stop their comprehensive environmental review of the Dakota Access Pipeline and grant the final permit. WE are not going to stand by and allow this to happen…It’s up to us to deny that request. Please add your comments of opposition to DAPL TODAY! A complete review is needed to assess the impacts on drinking water, tribal rights and the climate and we need your help to make it happen so, Please share this page with your social networks with links provided. Thank you! We've added new Email Newsletter Categories for you to receive just the news you want! We've added categories that will ensure you get just the information and action alerts you want. Some of the new ones are: Save Our Roots: A campaign to stop genetically engineered trees to supplement and/or replace fossil fuels for energy; Keep It In The Ground: News and action alerts having to do with oil and gas extraction on Indigenous territories, coastal waters, and public lands; and Indigenous Women Rising: Stories and profiles from across Mother Earth, as well as, reminders for New Moon Ceremonies supporting the Indigenous Women's Treaty. Click here or the Preferences link in the header and footer of this email. You can change your preferences anytime. We also want to thank everyone for their unwavering support over the years and a warm Welcome to our new subscribers! If you ever have a question or comment you can send to: media@ienearth.org and we will respond as soon as possible. 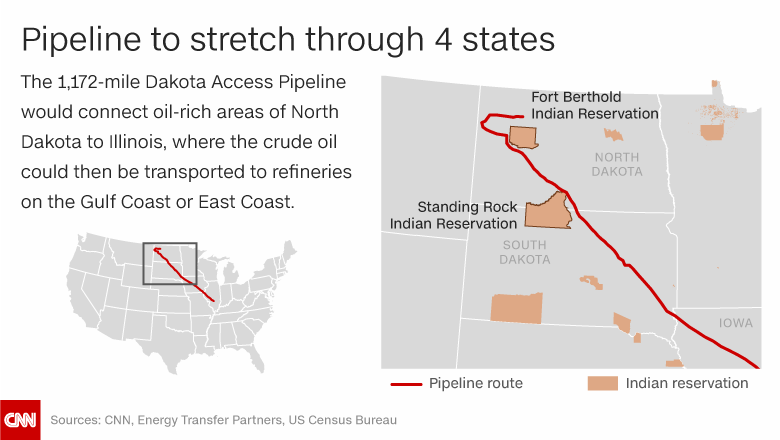 (CNN)The US Army Corps of Engineers has been directed to allow the completion of the Dakota Access Pipeline, North Dakota Sen. John Hoeven said on Tuesday. Hoeven said in a statement that he had spoken with Acting Secretary of the Army Robert Speer on Tuesday. The Republican senator said he was told that Speer had "directed the Army Corps of Engineers to proceed with the easement needed to complete the Dakota Access Pipeline. "The Standing Rock Sioux tribe, which opposes the project, responded that Hoeven's announcement is premature and maintains that further environmental review is needed for the pipeline. Cramer, R-North Dakota, said he received word that the US Army Corps will grant final approval and that Congressional notification of the decision was "imminent." In his statement, Cramer praised Donald Trump as a "man of action," after the President signed executive actions to advance approval of the Dakota Access oil pipeline last week. The construction had been blocked by President Barack Obama's administration amid vociferous opposition to the project. The Indigenous Environmental Network, a leading tribal organization dedicated to blocking further construction of the project, said on Tuesday: "Make no mistake: we are prepared to mobilize and resist this brazen power grab. "CNN's Sara Sidner and Darran Simon contributed to this report.